SECTION ONE, 1. 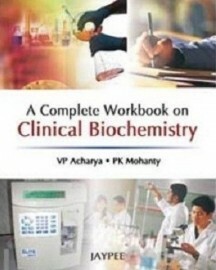 Introduction to Clinical Biochemistry, SECTION TWO, 2. Qualitative Estimation, 3. Quantitative Estimation, 4. Data Interpretation, 5. Spotters. Salient Features: This book is targeted for undergraduate students to help them in knowing the practical aspect of the subject as well as the interrelation of Biochemistry with clinical aspects. Workbook pattern has been introduced to exercise the students in the subject and enhance their reproducibility in the examination. Principles of all the tests have been given. Questions at the end of each Chapter prepare the student for practical viva-voce. Case reports orient the students to medical application of the basic sciences and prepare them for the viva-voce as well. A list of spotters has also been given after consulting many syllabi. Useful not only for the basic science students but also for the medico-clinical students. VP Acharya MBBS MD (Biochemistry) has obtained her graduation and postgraduation degree from VSS Medical College, Burla, Orissa, India. She is currently serving as Assistant Professor in Vinayaka Missions Medical College, Karaikal, Puducherry, India. She has been an outstanding scholar all throughout her career and has published many scientific publications in national and international journals and has presented research papers in various conferences. She has been associated in different academic activities and is the editor to the college magazine of Vinayaka Missions Medical College as well as the Scientific Wall magazine of the Department of Biochemistry. PK Mohanty BSc MBBS MD (Biochemistry) has worked in various capacities in hospitals, academic and non-academic health institutions. He has wide experience in the field of hemoglobinopathies, Environmental Biochemistry and setting up Biochemistry laboratories for academic institutions. Presently, he is working as Associate Professor in Vinayaka Missions Medical College, Karaikal, Puducherry, India.